Hmm... I don’t remember why I wrote that phrase—last November, it was (I date everything). But it got routed to the batch of notes here that’s material for this part of what’s now named “for the love....,” I guess because it was a phenomenon—or troped an association—that appealed to me at the time. But I forgot to note why, and now I don’t remember. 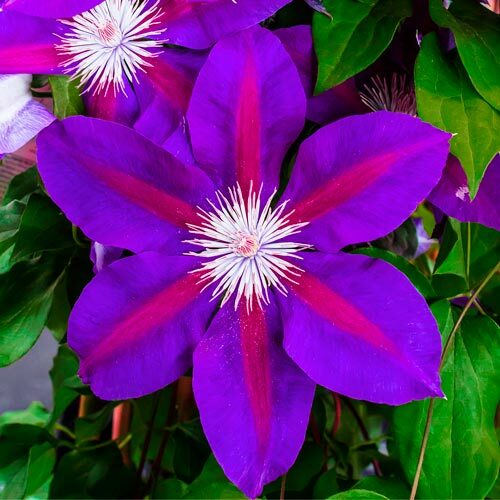 I don’t know flowers actually, so I Googled ‘violet flowers’ and see a few that resemble ones I’ve seen around town (audacious“Clematis”!—great for a wedding dress) and around campus (shy neughborhoods of “Verbenas”)—but none exactly that I’ve seen. Maybe it wasn’t about flowers. It could be about a Pantone range of colors. But I don’t know why he’d write that. He hasn’t been wrapped up in graphic design for years, notwithstanding the appeal of “a metaphoricity of color” (two thirds down). Maybe it’s about some “delicate” young woman who has an aura of intense self-determination (to those who can see)—and was wearing a dramatically flowered dress. “Audacious violets!,” Clematis said to her sorority sister, Verbena—who laughed dismissively—as they suffered the excluded girl’s Attitude at a nearby table in Caffè Strada. I’ve always been attracted—always (since Fourth Grade)—to girls who are shy, as I was for years, but are sharp minds indeed—and easy to see, if you can—“destined” to become a teen of secreted but shameless wit, then “a woman of profound mind” (as Jane Austen might say, according to “Becoming Jane,” I streamed last night). “Invisibles see each other,” I said, unaware I hadn’t bespoke myself silently. Clematis turned my way. “What?,” looking insulted—feeling clueless?